June is a very special month. Josefine and my dear friend's son, Aaron celebrate their 1st Birthdays (only 1 week apart! ), so we visited our friends for an early Birthday Party. Here is just one of the photos from this weekend. 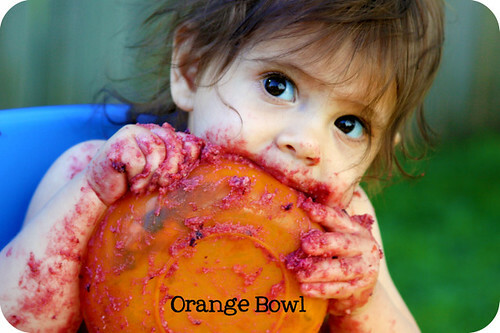 Yes, the bowl is REALLY orange. ;) Don't you just LOVE a messy 1st Birthday Cake!